Ankylosing spondylitis (AS) and related forms of spondyloarthritis (SpA) are, as a group, as common as rheumatoid arthritis (RA). Their presenting clinical manifestations are wide-ranging and heterogeneous, and the patients end up seeing a variety of medical and surgical health care professionals before they get diagnosed. Early diagnosis and effective management can mitigate the severity of the disease, and make a meaningful difference in the lives of these patients. This book provides evidence-based, practical information on all aspects of AS - Axial SpA, with emphasis on clinical features, pointers for early diagnosis, and comprehensive coverage of current treatment options, including the latest biologic therapies. Ankylosing spondilitis (AS for short) is a chronic form of arthritis known to affect up to 1 in 200 people (over 1 million sufferers in the USA alone). 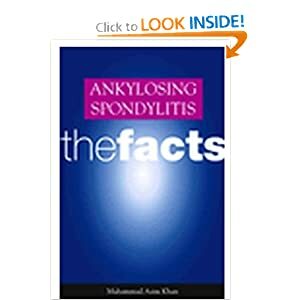 Ankylosing Spondilitis: the Facts by Muhammad Asim Khan, MD is the first mass produced book to be published in English on this important disease, it provides clear and accessible information on treatment, diagnosis, genetic counselling, and daily life for patients with this illness. Professor Muhammad Asim Khan is one of the leading experts in the world on AS, while also suffering from it. This combination of scientific knowledge and personal experience of a debilitating disorder results in a unique book which is invaluable for sufferers wishing to know more about their condition, and for those that share their lives. There is newly available highly effective treatment for AS, although no cure has yet been found. Early diagnosis and proper medical management is important in reducing the risk of disability and deformity. The book has been translated into other languages, including Japanese, Persian and Portuguese. Spanish translation is in process. 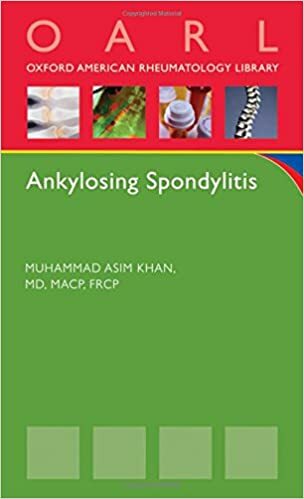 Book Review : "Dr. Khan, a legendary rheumatologist and spondylitis researcher, has come out with his second book on ankylosing spondylitis (AS)...... Epidemiologists will find this a one source book of the different criteria for classification of AS, and of spondyloarthropathies in general. There are excellent tables showing the different treatment response criteria. Students of medicine and rheumatology alike will find the description of these criteria and their temporal updates particularly useful...... A separate chapter is dedicated to anti-tumor necrosis factor therapy that has revolutionized the management of AS...... We commend this book to general physicians and rheumatologists alike." Ankylosing Spondylitis (AS) and related diseases called spondyloarthropathies (SpA) are the second most common form of chronic inflammatory arthritis after Rheumatoid Arthritis (RA). Unfortunately, most patients with AS and SpA are either never diagnosed, or they are inadequately treated. The current mean delay in the diagnosis of AS ranges from 5 to 10 years, and the presenting clinical manifestations of these diseases are wide-ranging and heterogeneous, and thus a variety of health care professionals see AS and SpA patients, from primary care physicians to rheumatologists and other medical and surgical specialists. With the availability of newer, highly effective treatments and better methods of musculoskeletal imaging, such as the MRI, there is an urgent need to improve early diagnosis and reduce any inappropriate delay in obtaining effective treatment. Earlier diagnosis and treatment can mitigate the severity of the disease, and make a meaningful difference for patient care and quality of life. This pocket-sized book is designed for specialists and generalists alike, and is intenteded to expedite accurate early diagnosis and initiation of appropriate treatment in order to alleviate unnecessary suffering. It provides practical, evidence-based information for clinicians to aid diagnosis, treatment, and follow-up care for patients with AS and SpA. It provides pointers to early diagnosis, prognosis, clinical manifestations, socioeconomic aspects, and comprehensive coverage of current treatment options, including the latest biologics, as well as non-drug therapies.